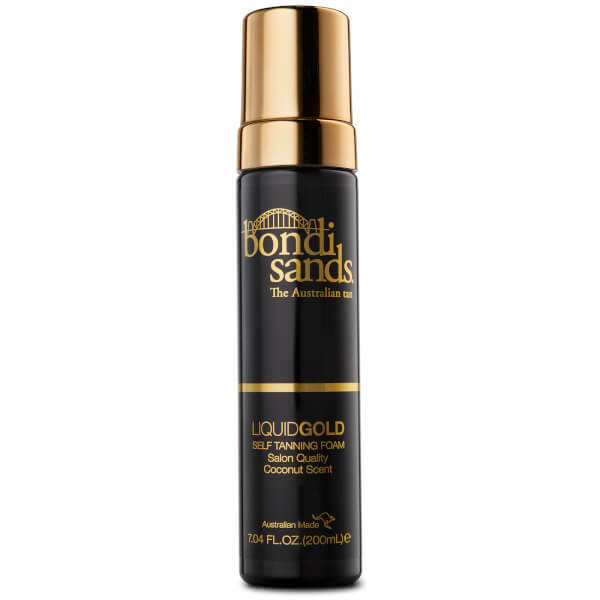 Experience an Aussie tan in no time with the Bondi Sands Liquid Gold Tanning Foam, a hydrating self-tan foam that develops into a salon-quality golden tan. Developing after two to three hours, the fake tan is easy to apply and is touch dry in seconds. Leaves skin looking bronzed and glowing. Enriched with Argan Oil and an exotic Coconut scent. For an even streak free tan use the Bondi Sands Exfoliating Mitt to ensure skin is clean and smooth. 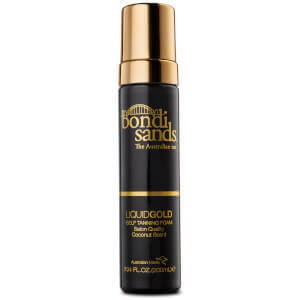 Pump foam applicator firmly and apply Bondi Sands Self Tanning Foam liberally to a Bondi Sands Self Tanning Mitt before using a long sweeping motion to legs, arms and body. Use remaining residue on tanning mitt for face, elbows and knees. Wait until touch dry for dressing. No shower necessary. For a deeper tan reapply 30 minutes after application. Aqua, Dihydroxyacetone, Propylene Glycol, Alcohol, Polysorbate20, Dimethyl Isosorbide, Oleth-20, Pentylene Glycol, Erythrulose, 1, 2-Hexanediol, Argania Spinosa Kernal (Argan) Oil, Caprylyl Glycol, Hydrolyzed Jojoba Esters, Cocos Nucifera (Coconut) Oil, Parfum, PEG-7 Glyceryl Cocoate, Phenoxyethanol, Sodium Metabisulfite, Tocopheryl Acetate, Coumarin, FD&C Red No.4 (CI 14700), FD&C Yellow No.5 (CI 19140), FD&C Blue No.1 (CI 42090).